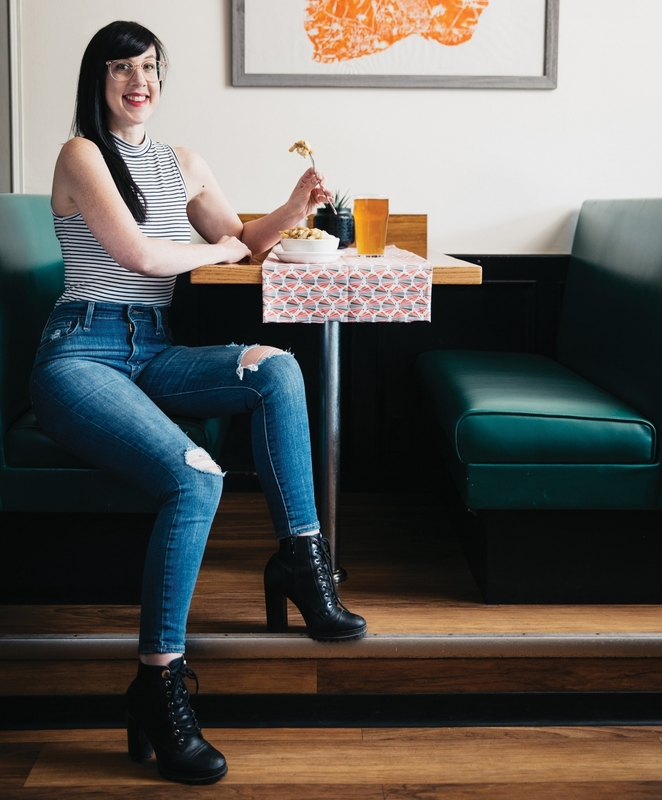 We asked notable Edmontonians to pick their favourite drinks, dishes and treats in the city. visiting friends and relatives, a place for a nightcap after a full festival day or a spot for a cold, refreshing treat – from hidden gems to places that made our Best Restaurants list, there’s something for every occasion. Read on and dig in. 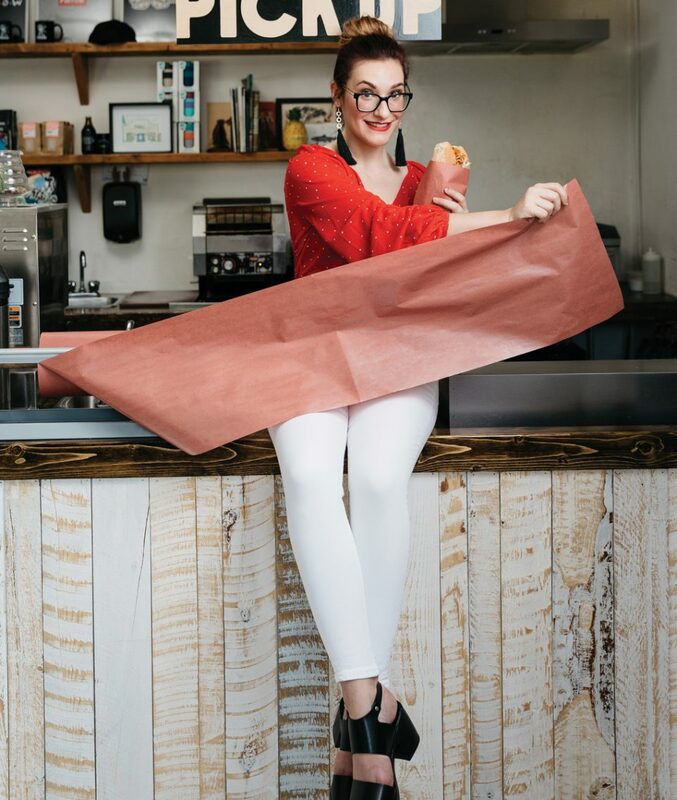 Sam Maggs frequently travels to conventions and events to share her pop-culture knowledge, but experienced a more permanent relocation two years ago when she traded in Toronto for a new home in Edmonton. And, while she’s used to creating new worlds in comic books and video games, it was a different experience in real life – until she found Farrow. Farrow’s menu does change on the regular, but whenever the Lil KimChi is on the line-up, it’s Maggs’s go-to. While she’s not a vegan herself, the combination of braised jackfruit, housemade kimchi, bean sprouts, sesame slaw and Sauce Korea is out of this world in her eyes. – A.M. 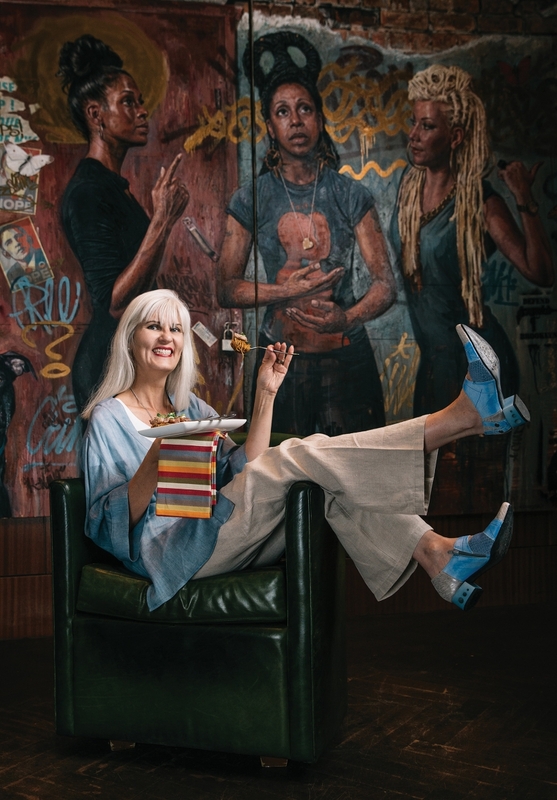 The Peter Robertson Gallery is located in the heart of the 124th Street Gallery District, and gallery director Camille Robertson doesn’t have to venture very far if she’s craving something refreshing. In fact, she just heads down the street to pick up her treat of choice – the lemonade from Duchess Bake Shop. “The walk or bike ride there is not far from the gallery, and I always try a treat to go along with the lemonade,” says Robertson. After all, who can resist the tempting pastries on display? – A.M.
And that’s how I found out Sgt. 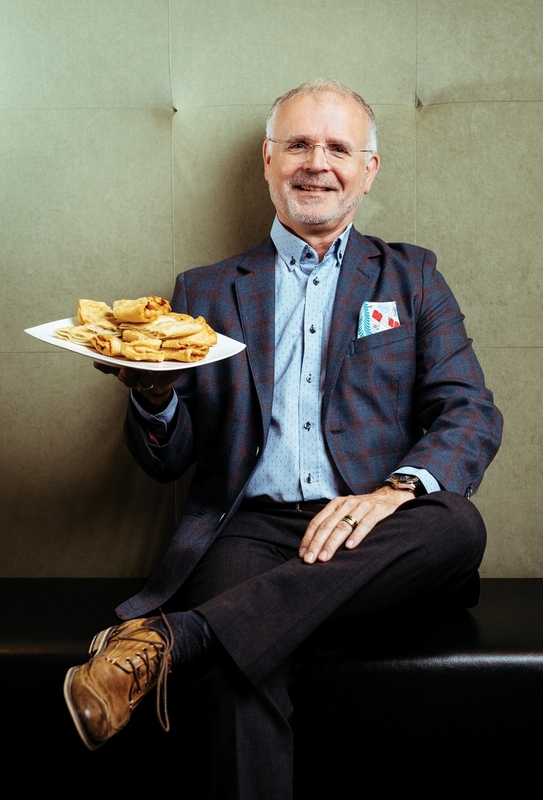 Jones, a Top 40 Under 40 alumnus, is basically the brand ambassador for The Nook’s cinnamon buns, with a liberal dose of bacon applied atop the brown sugar icing. It’s sweet, with a touch of salt. And, well, it comes in a massive, don’t-need-to-eat-for-the-rest-of-the-day portion. “I worked with many community partners while in Downtown Division and The Nook was one of them,” says Jones. “When you’re working out in the elements, it’s nice to have a welcoming spot to warm up or cool down. Stopping by for coffee and a check-in would sometimes include comfort food. 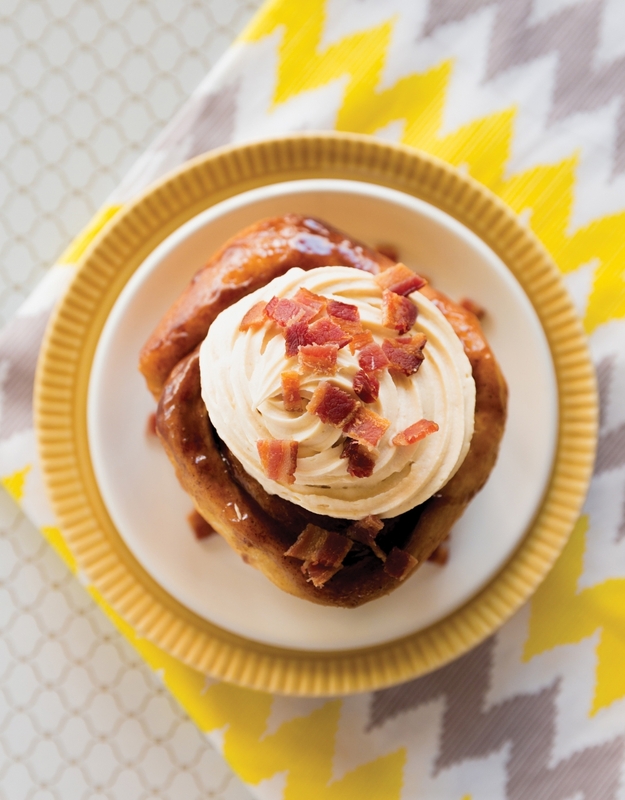 What’s more comforting than bacon and brown sugar cream cheese on a cinnamon bun? I understand that the genesis of the buns were that they over-crisped some bacon and needed creative ways to use it up. Mistake or divine intervention, they’re delicious.” – S.S.
Pilar Martinez will never turn down dessert, but her sweet tooth is best satisfied with the delectable layered carrot cake at Vi’s for Pies. “It’s made of carrots and pineapple, covered with cream cheese and almonds, and essentially includes all the food groups. I rationalize that it really is a ‘healthy’ dessert,” Martinez says. But, let’s be honest, there’s no need to justify its nutritional value when it tastes so, so good. Luckily for Martinez, she can pick up a slice at Vi’s almost whenever she wants, as it’s within walking distance of her home. “Vi’s is a quaint and friendly local spot where you can sit and enjoy dessert, or take it to go. And there is now an adjoining Vi’s bakery space where you can buy a mini carrot cake or even a full-sized for those days when you really need a dose of sweetness.” – B.M. 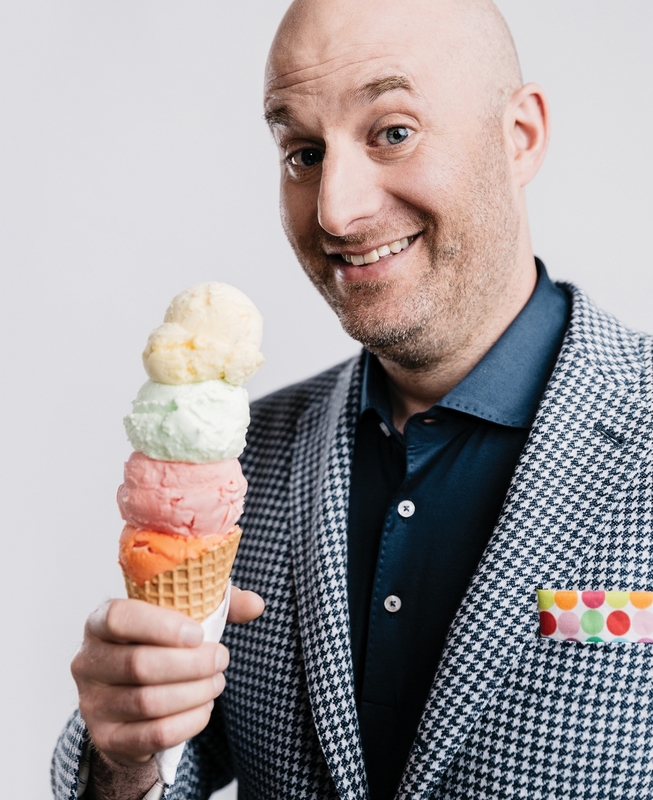 There’s not much better on a hot summer day than an ice cold ice cream cone and, for Matt Singer, ice cream is a family tradition. “During the summer, my wife and kids and I go to my parents’ house for dinner every Sunday. When the kids (and their dad) are lucky, grandma and grandpa take us all for ice cream at Cococo afterwards,” says Singer. We’re pretty sure that’s the perfect way to finish off a meal. And, when it comes to the gelato at Cococo Chocolatiers, you’ve got many more options than the typical chocolate and vanilla. The flavours rotate, so you’ll always find something new to try, from popcorn to mojito, s’mores to lavender lemonade. 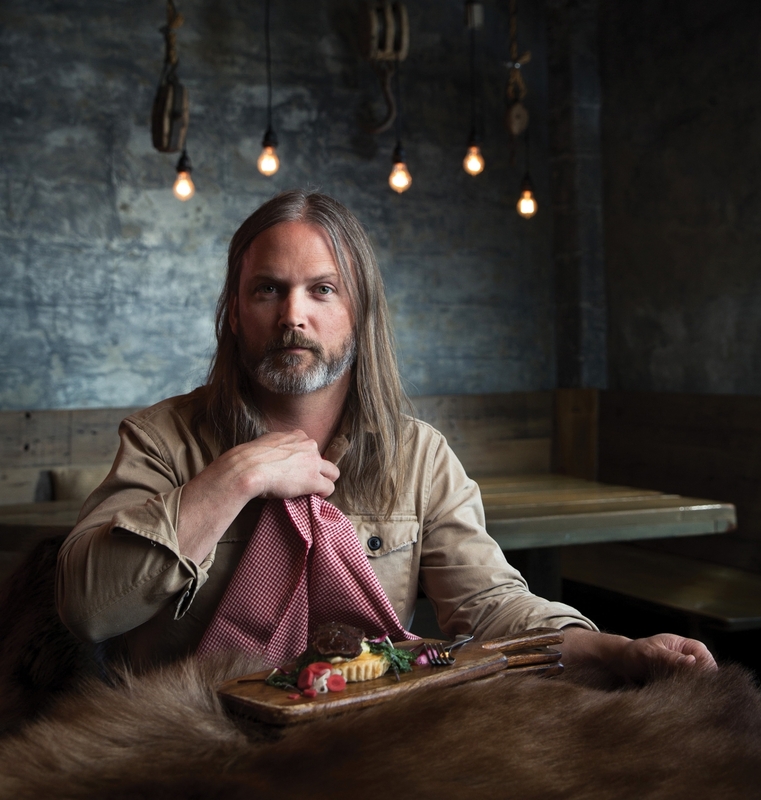 – A.M.
Top 40 Under 40 alumnus Kevin Kossowan is an integral part of the Edmonton food community, though, instead of in a kitchen, you’ll find him hunting, fishing, foraging and cooking in the great outdoors. The third season of his web series, From the Wild, which documents these excursions and experiences, was nominated for a prestigious James Beard Award this year. But when Kossowan does eat out, he turns to a dish after his own heart; the Questionable Bits at RGE RD. This menu option changes every day, but is essentially animal offcuts. “It’s the right combination of aligning with my personal philosophy around food waste, and thinking critically about what it is we’re eating,” Kossowan says. “It’s also a format of hospitality I enjoy – one where you put your fate in the hands of your host. One day it might be a phenomenal liver dish, another a roasted fish head – it’s not something you would cook at home but is absolutely delicious in the right hands. Chef Blair Lebsack has really led the way in whole animal cookery, not just locally, but nationally.” – B.M. Jay Bardyla goes out for brunch a lot, but he won’t order an eggs Benny. He won’t go for the chicken and waffles. Time after time, he goes for the French toast, no matter where he goes. You might just want to call him a French toast connoisseur. “It’s something I love to eat, but would never make myself,” says Bardyla, who has worked with schools across Alberta and with the Edmonton Public School Foundation in promoting literacy and the graphic novel as an art form. The shop won an award for its Artist-in-Residence program from the Mayor’s Celebration of the Arts. He also has a ridiculous collection of superhero T-shirts. He used to love the French toast at The Druid on Jasper Avenue, but that is now The Urban Tavern. So, the Banana Bread French Toast at Hart’s Table and Bar has taken over. It’s served with a walnut caramel and a blueberry compote. What Bardyla says sets this French toast apart (remember, he’s a connoisseur) is the fact that the bread isn’t too dense. The texture of the French toast is just as important as the taste. – S.S.
Tim Yakimec is a connoisseur of the arts, having spent decades in the world of opera. However, when it comes to the culinary arts, he admits that he’s “so not a foodie.” There is one particular culinary tradition, though, that holds a special place in his heart – unsurprisingly, it’s tied to an arts festival. Yakimec has been going to the Fringe Festival since 1983, and always makes sure to pick up a green onion cake while he’s there – it’s part of the Fringe experience for him (and the legions of green onion cake fans in Edmonton would have to agree). “It’s kind of a nice signature treat for when we’re wandering around in between shows,” Yakimec says. – A.M.
Andrea Anderson is an established science writer, who has penned articles for Discover, Audubon and Scientific American. She has a degree in biology, a Master of Arts in journalism, and a Master of Science in cell biology. So, of course, mixology should fascinate someone whose professional life mixes art and science, right? And Anderson’s favourite is The Flowers of Youth, Wishbone’s cocktail that unites gin, chamomile grappa, Cointreau, cocchi Americano, lemon and absinthe. “My first Wishbone visit was for a very tasty, special occasion dinner, but I discovered this particular drink during a random, midweek outing with my gentleman for cocktails and snacks,” says Anderson. “It’s often tempting to curl up at home with a glass of wine after a busy day, so if I’m going out for a cocktail I’m looking for a bit of a treat. The Flowers of Youth checks a lot of boxes for me. I’m a sucker for citrus flavours – especially lemon – and they work very well with the berry and flower flavours from the gin and liqueurs. It’s a light, refreshing cocktail with a citrus bite, topped with a perfect dried flower garnish. Plus, aren’t writers required to drink absinthe?” – S.S.
There’s nothing better than good friends and good food, is there? – B.M. 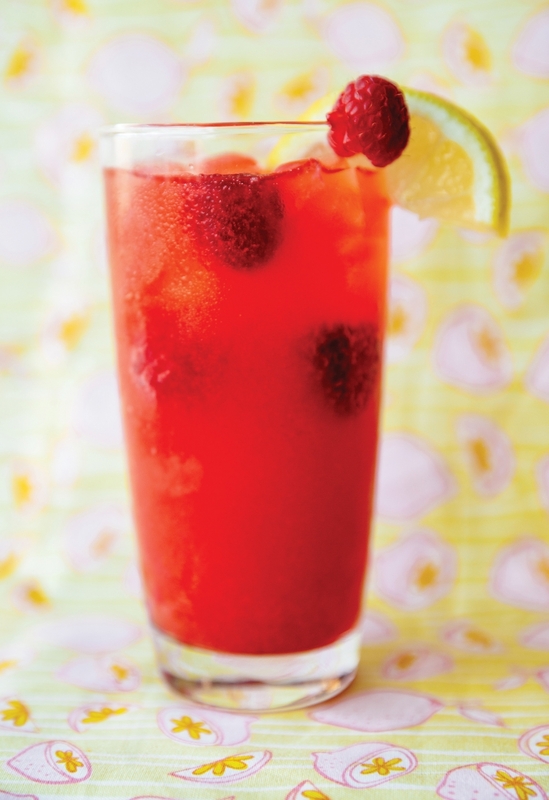 There’s nothing quite as satisfying in the hot summer months as gathering with a group of friends and sharing a pitcher of some kind of cold beverage – and this editor’s shareable drink of choice is a fruity sangria at Tres Carnales. After all, if you start your night with sangria, how bad can it be? – A.M. Served with Chantilly cream, the warm blueberry scones are staples of Ampersand 27’s weekend brunch menu. For Jodi Abbott, the scones are meant to be savoured, the perfect way to slow things down for someone who has the hectic day-to-day lifestyle of running a growing educational institution that houses a little more than 17,500 students per year. “These blueberry scones melt in your mouth,” says Abbott. “I eat them slowly to savour the blueberry richness.” – S.S.
He’s been nominated twice for Governor General awards for poetry. He’s won five Alberta Book Awards. And, you can sometimes find Tim Bowling working on his next project, in longhand, at the Mill Creek Cafe. It’s one of his favourite writing spots. Bowling’s from a British Columbia fishing community, and the fisheries have played major parts in his narratives. 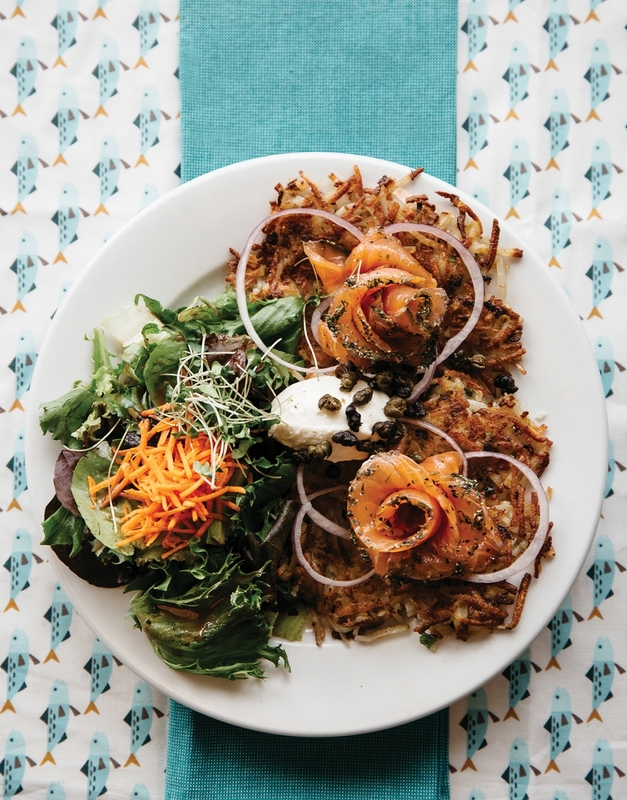 So, put all that together and you’ll see why he loves the Latkes Delux so much, as the potato pancakes are served with gravlax and Boursin cheese. 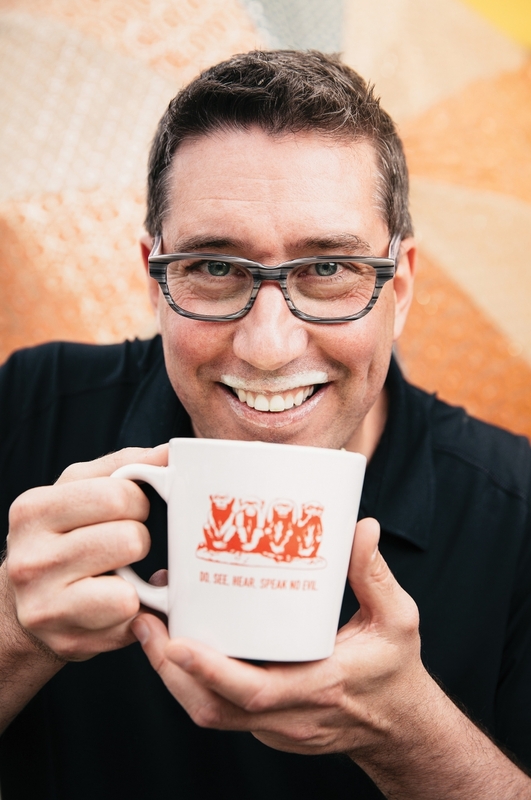 “I’ve been going to the Mill Creek Cafe almost since I came to Edmonton in 1995,” he says. “When my kids were younger – all three were home schooled to the age of 15 – I had to get out of the house to do my writing. So, most of my 20 books were written longhand in that cafe, which obviously makes it a wonderfully creative space for me. “The combination of salmon with potatoes of any kind takes me back to my fishing days on the Fraser, so I guess there’s nostalgia to go with that lovely combination of cold cured salmon, sour cream, capers and latkes.” – S.S. 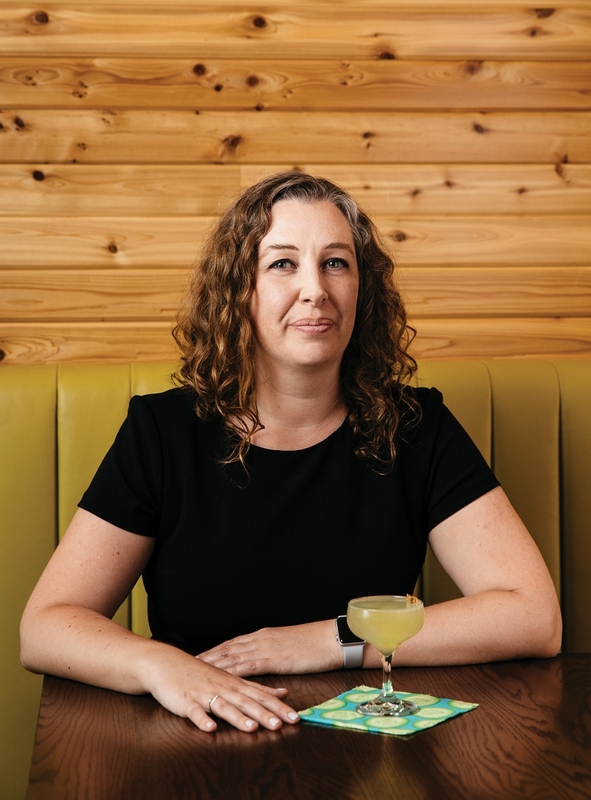 This Top 40 Under 40 alumnus was recently installed as MacEwan’s first director who oversees human rights and diversity issues on campus. He will be a resource for students and staff who feel they might be experiencing discrimination. For his favourite meal, though, he heads out of the MacEwan campus and goes north about 30 blocks. And, he lives on the south side, so it’s an even longer haul if he’s coming from home. But the food at Turquaz Kebab House, in his opinion, is worth it. “I came across the restaurant through word of mouth,” Chaudhry says. “Their reputation was growing within community circles. The dish itself is simple, but packed full of flavour. It is always cooked perfectly, and the charcoal flavour really brings out the taste. That’s the hook. 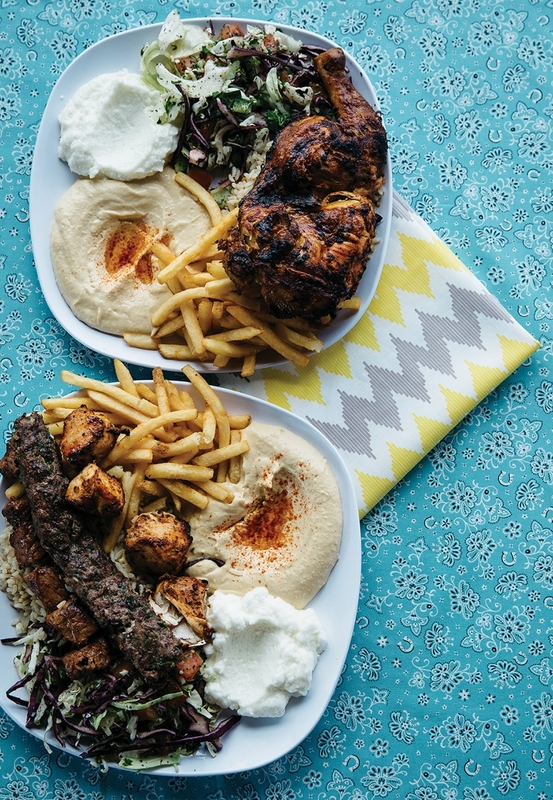 All dishes are served with fragrant rice, fries and a salad. All delicious.” – S.S. When Alex Prior wraps up a performance with the Edmonton Symphony Orchestra at Winspear Centre, he heads across the street to Oil Lamp for a celebration with delectable saganaki – salty, fried Kefalotyri cheese. “It’s outrageously delicious, I love cheese of all kinds,” Prior says. 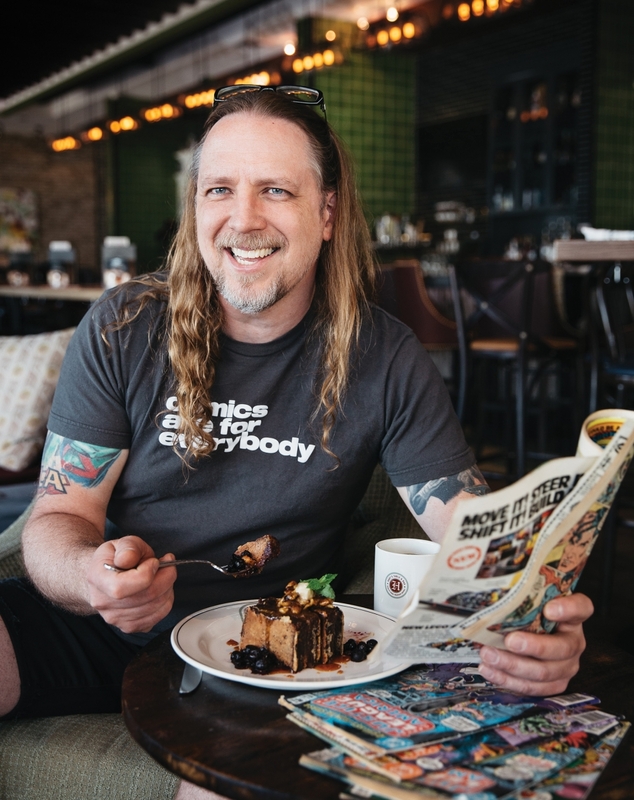 And, for someone who travels extensively for work – as we’re chatting cheese, he’s just returned from Australia where he debuted with the Queensland Symphony Orchestra – Prior likes the familiarity the cozy Greek restaurant gives him. “I love the sense of friendship and community there, they know me by name. I like these little local hangouts, they give me a feeling of community. I’m constantly on the go, so it’s nice to feel at home when I eat out.” – B.M. The former CEO of the Edmonton Metropolitan Region Board, Malcolm Bruce, has just taken over as CEO of Edmonton Global, touted as a new “transformative economic development company” for the region. Bruce spent more than three decades with the Canadian Forces and was deployed overseas five times, including a tour of Iraq in 2006 as part of an exchange with the British Forces, and a year in Afghanistan in 2010. Bruce is proud of his military service, and still gets together with his former comrades in arms. And the place they meet is The Celtic Knot in St. Albert. Bruce orders the Roast Beef Dinner, served with Yorkshire pudding and mashed potatoes. He says: “I love it because it reminds me of Sunday dinners at mum’s. We would always have a home cooked roast beef dinner, and it’s a tradition that we continue to this day. So, this dish just brings me back home. It’s also more than a meal for me here. It’s a meal, a few drinks and some old friends. Once a month, my army cohort has a gathering here. The boys all get together and catch up over a few single malts.” – S.S.
He’s Edmonton’s most recognized wine expert, and he regularly goes abroad to taste and judge the offerings from some of the world’s finest vineyards. So, needless to say, Gurvinder Bhatia has a refined palate. When Bhatia looks for a sweet treat, he heads over to Breadland Organic Whole Grain Bakery, whose cashew date squares feature the added flavour boost of organic coconut. “They had these cashew date balls – now they are squares,” he recalls. “I like cashews, I like dates, so I ordered one and loved it – this was many years ago that I first had one. They don’t muck around with the ingredients so you get the full flavour of cashews – more like cashew butter as the cashews are ground up – and dates. 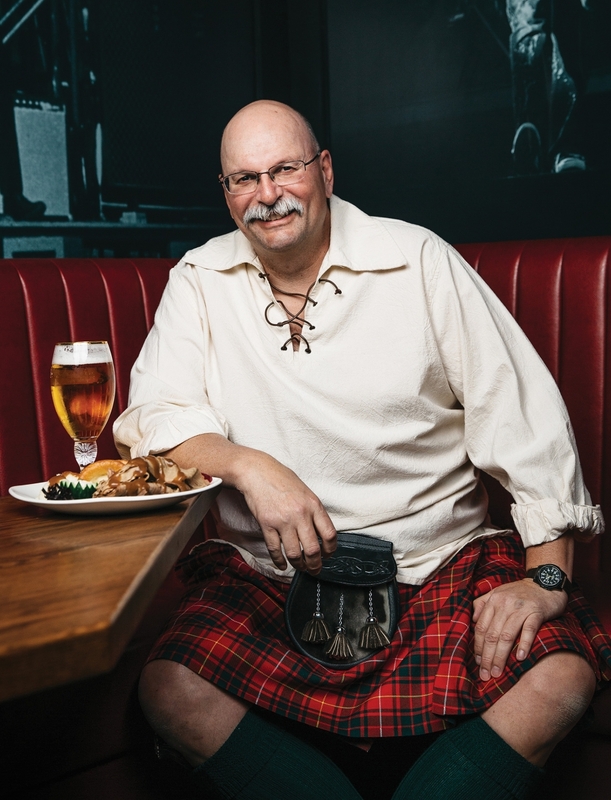 Texture is great, flavour is great and it’s a great snack and relatively healthy.” – S.S.
Jonathan Christenson loves living in the walkable neighbourhood of McCauley, and one of the destinations that he and his wife and son most frequent on foot is Otto. While his son goes for the Otto Dog and the three of them split the coleslaw and garlic fries, Christenson always puts in an order for the Italian Fennel, Merguez and Thai Green Curry Chicken sausages. “With the sun streaming in through Otto’s west-facing garage doors – which are always open in the summer – the friendly, relaxed vibe, the amazing food and the great prices, there’s no better way to spend a warm summer evening,” Christensen says. “After dinner, we usually hang out for a while and enjoy a laid-back conversation with Ed [Donszelmann], the owner, while our son sits and draws – they even have one of his pictures on the wall behind the bar.” – B.M. After 18 years of selling contemporary clothing and footwear from her Whyte Avenue Boutique, C’est Sera, Kelly Campbell has quickly expanded her retail empire. In less than a year she opened three new stores, under the new brand Kelly Wollf, in Londonderry Mall, at RAAS in West Edmonton Mall, and in Premium Outlet Collection Edmonton International Airport. Managing and merchandising four stores in four different areas of the city keeps Campbell busy, and she definitely works up an appetite running between spots. So when she has some downtime, she refuels and indulges with what is arguably XIX Nineteen’s most popular dish – the Ahi Tuna Twists. “I love seafood and have never had anything like this, it’s just so quirky and original,” Campbell says. “I go to Nineteen specifically for this dish.” – B.M. Aaron Paquette grew up in a neighbourhood with many Chilean families who had fled the Pinochet regime. “My mother participated in a lot of community kitchen events with them,” Paquette recalls. 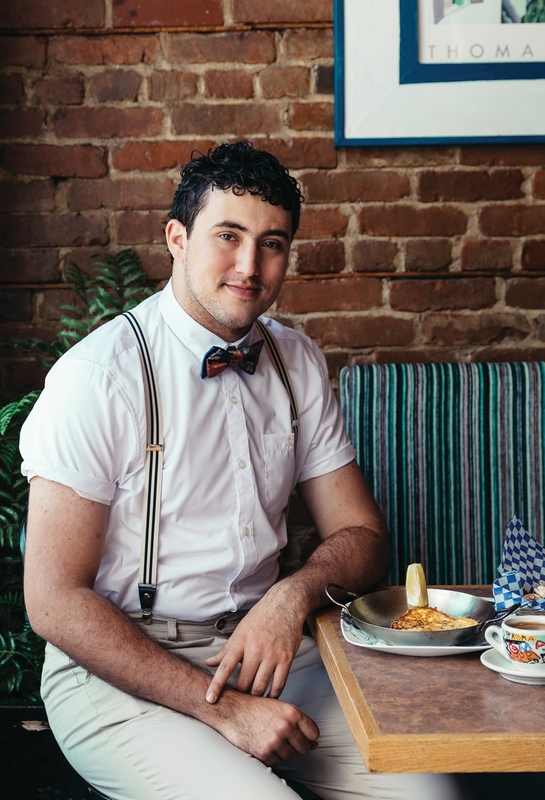 “There were always incredible smells and lots of laughter and chatting in the room whenever they got together.” While Paquette has lots of memories of being in the kitchen and tasting all of the delicious foods, empanadas were his favourite. The first time he ate at Azucar Picante, he was reminded of his childhood. “It reminded me of when we would get together to cook and eat as a community,” Paquette says. “The food and the people who make empanadas at Azucar remind me of my introduction to this beautiful food and culture. It brings me back to that time with my family and my community.” – B.M. As someone with an extensive health and science background, Top 40 Under 40 alumna Carla Prado always has nutrition in mind. Luckily, her research fits with her love of picanha, a juicy and tender cut of top sirloin cap steak, one of several cuts served during the rodizio all-you-can-eat meat feast. “Meat is one of the best food sources for protein,” Prado says. “Building muscle mass could not taste better.” The dish also brings back childhood memories for Prado, who grew up in Brazil. “Picanha barbecued on the skewer is a traditional weekend dish, served with white rice, farofa (seasoned cassava flour) and vinaigrette. The entire family gathers around the grill spending hours together while slices of meat are offered,” Prado says. And now that Pampa has a second location in Ellerslie, where Prado lives, it’s literally close to home. – B.M. Martin Dugas came to Edmonton to play professional indoor soccer. He and his wife, Wendy, then chose this city as the place where they would raise their families, and now both play key roles in non-profit sectors. Wendy is a Top 40 Under 40 alumna and current CEO and president of the Glenrose Rehabilitation Hospital Foundation. Martin is the CEO of Wellspring Edmonton, an organization that helps support cancer patients and their families, with programs ranging from art and music therapy to yoga to child care. In 2017, its first year, Wellspring served more than 1,500 cancer patients and their families. When Martin meets with clients, he likes to go to Remedy’s original Garneau location and enjoy a cup of floral Kashmiri Chai. “One time while meeting to do some planning for my son’s soccer team, our team manager suggested the Kashmiri Chai,” recalls Martin. “The flower petals, crushed pistachios and spiced topping mixed with the creamy goodness has become a favourite of mine for any meeting.” – S.S. When Nathan Beck moved to Edmonton from Medicine Hat in 2009 to start his undergraduate degree at the University of Alberta, he was on a mission to find a good steak sandwich. He didn’t have to search for long, as one of the first restaurants he ate at was Accent Lounge, where he discovered its Tenderloin Sandwich. “I love all kinds of steak sandwiches, from the five-dollar ones to fancy ones,” Beck says. “But this one is the best.” Served on Portuguese bread with goat cheese, cucumbers and a side of potatoes and salad, Beck’s glad the recipe has never changed. “I go there every year on my birthday to eat it, so when my friends ask where we’re going for my birthday it’s always like, ‘Accent Lounge for the steak sandwich! '” – B.M. Buco, a restaurant affiliated with the Sorrentino’s Restaurant Group, has been expanding in the past few years, with new locations open downtown and in Windermere. However, when it comes to her Sorrentino’s experience, Councillor Sarah Hamilton prefers the tried and true West end location. “It’s been a common gathering spot in the community for decades,” says Hamilton. 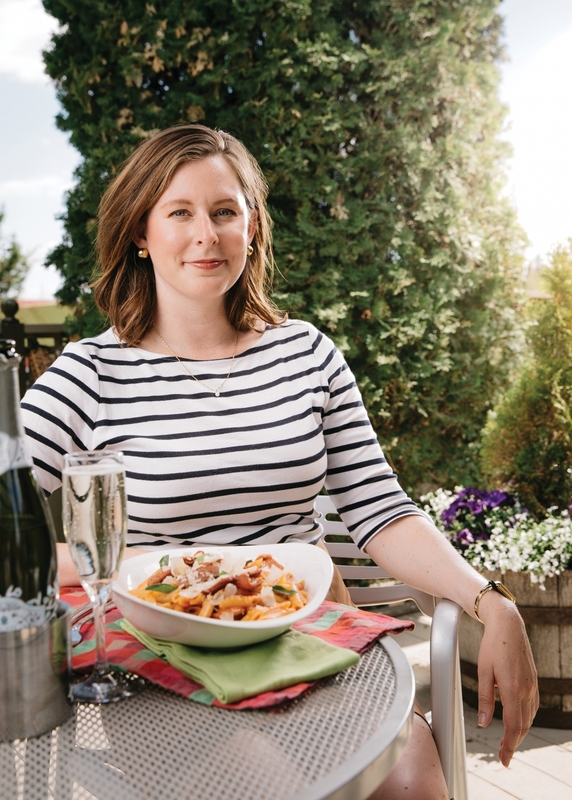 And, for Hamilton, the penne arrabbiate with Sorrentino salad isn’t just her favourite dish – it’s something worth cutting a vacation short for. “When I was a teenager, I won a contest that included dinner at Sorrentino’s and a limo ride to see Miss Saigon at the Jube, and my dad and I ended up driving back early from a vacation in Banff so that we could take advantage of it. I believe I got this dish that night.” – A.M. This past February, on an outdoor rink located at Brent Saik’s Ardrossan home, the optometrist and his fellow amateur hockey enthusiasts played hockey for 251 consecutive hours, raising more than $1.2 million for cancer research. So, given that, the man has earned the right to have a nice, cold cocktail, right? Saik likes a good cocktail, but he doesn’t like them overly sweet. And, because he doesn’t like things that are overly sweet, he’s not a rum fan. Of course, then, he’s picked a mojito as his favourite thing. Because, well, that makes perfect sense. Saik said the drink was suggested to him during a visit to Browns because of exactly what it isn’t: Overly sweet. “Most of the time, mojitos are too sweet,” said Saik. “But theirs are just right. And, when I have one, it has to be a double. That’s a given.” – S.S.